One of our residential customers sent us two great photos showing how she is using her Standard portable room dividers. Providing a private in-home health care bedroom with a door can lend the perfect solution to dividing space in a home. Mary’s granddaughter needed a place to stay on the weekends while she finished up her education. Unfortunately, all the bedrooms in Mary’s home were occupied so her only alternative, was to add a wall between her kitchen and living room. Mary originally looked at providing a private space for her granddaughter without having to build any permanent walls. The guest room would only be needed for about three years and she felt that a permanent wall would be way too costly. So Mary contacted Screenflex. 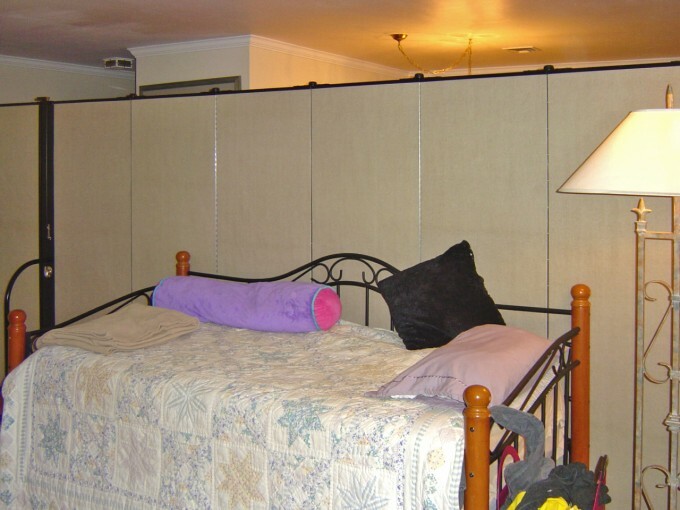 Mary purchased one 7-panel (13′ – 1″ L x 6′ H) divider and she added the door option. Both grandmother and granddaughter love the privacy the wall creates. The Screenflex wall is beautiful and perfectly serves my purpose for ordering it. My granddaughter loves it and enjoys the privacy it provides. Portable dividers can be pulled open during the week and stored in a space as small as 2′ x 3′. 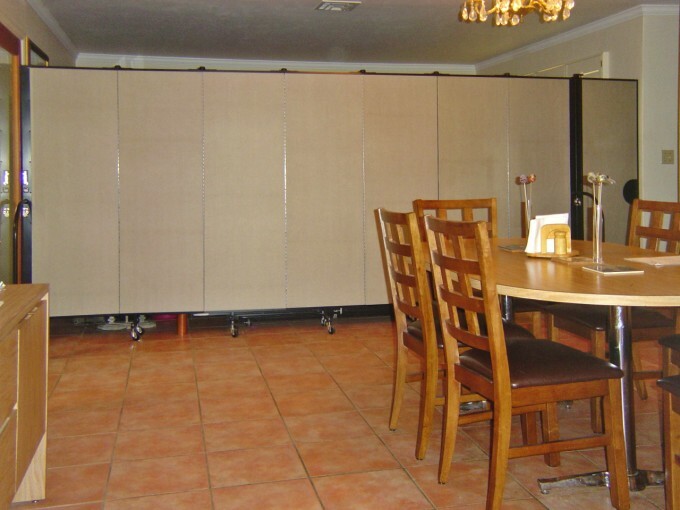 When Mary’s granddaughter is with her on the weekends, they pull the divider across the room to provide a nice visual barrier and sound barrier between the kitchen and living space. An added benefit to the room dividers are the tackable and pinnable panels. Panels accept thumb tacks, staples and push pins to allow posters and artwork.